Leggett, Texas, 09/16/14: One of 3 large trailers filled with marijuana exits property off FM-942 East, as short distance from US-59. Sheriff's Office Eradicates Another Large Marijuana Grow, LEGGETT, September 16, 2014 - Shortly before sunrise on September 16, 2014, detectives with the Polk County Sheriff's Office with help from other local law enforcement agencies within the county and surrounding counties eradicated 21,540 marijuana plants off private property in Leggett. Accordiing to Polk County Cheif Deputy, Byron Lyons, an informant tipped off the Sheriff's Office late Sunday afternoon. Detectives went Sunday evening to take a look. Due to daylight running out, detectives returned on Monday, and with the use of a DPS helicopter were able to find a field of marijuana. The search intensified and when all was said and done, ten fields were found and eradicated. Dogs from the Texas Department of Corrections were brought out to sweep the fields in hopes of finding suspects. No suspects were found. Chief Lyons stated that the operation was elaborate with every measure taken to conceal their lucrative operation. Marijuana was found already cut, and hung upside down to dry and ready to be picked from the stems and packaged for sale. Lyons further stated that in spite of 4 fields being found in recent weeks, it's not just a Polk County Problem, but that it's a problem that's occurring throughout East Texas. Lyons emphasized that law enforcement alone can't eradicate all the marijuana grows, but that the local law enforcement needs the public's assistance. He stated that the public needs to be aware of their surroundings and that any suspicious activity be reported to local law enforcement. He emphasized that the citizens need to be careful as the keepers of the marijuana fields are dangerous as they've found firearms in each of the operations that they've eradicated. Detectives don't believe that the operations are from locals, but rather people from outside Polk County, but he did not want to jump to conclusions that it's the work of drug cartels. September 15, 2014, detectives use a 4 wheeler to help search a large tract of land in Leggett. A panoramic view shows large marijuana plants that have been picked and hung upside down on wire to dry. 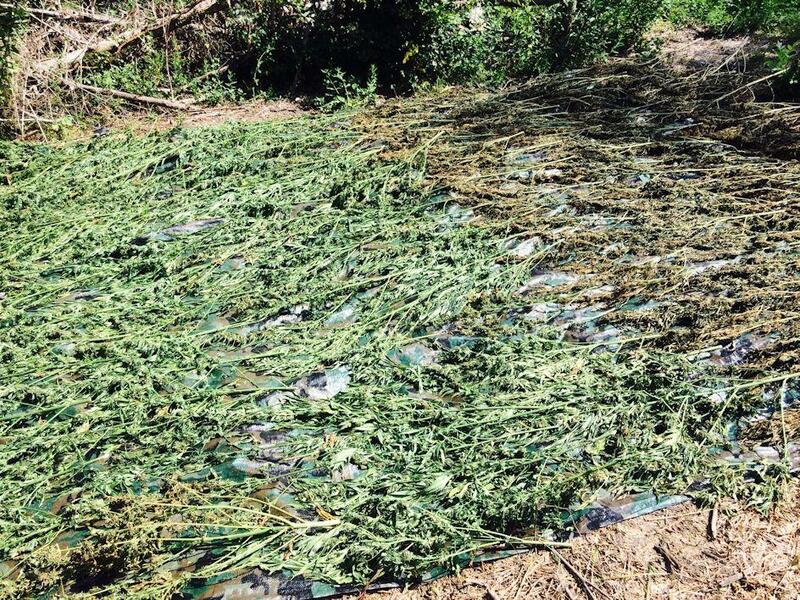 More marijuana laid out to dry on a camouflage tarp. 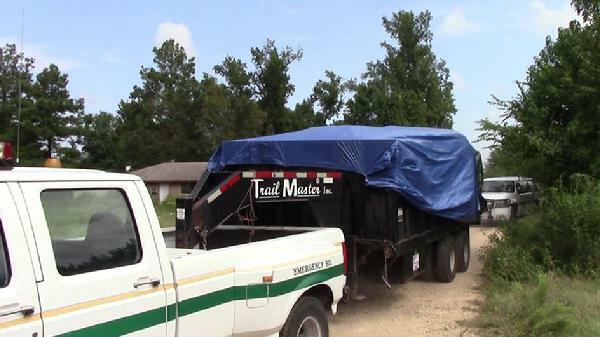 Texas Forest Service brought in a bulldozer to assist with plant eradication. With stifling heat, an air conditioned command center is set up. These dogs lived on property adjacent to the marijuana grow.